Forest fires raged uncontrolled in several places across Greece on Monday, destroying homes, disrupting major transport links and sending people fleeing for their lives. 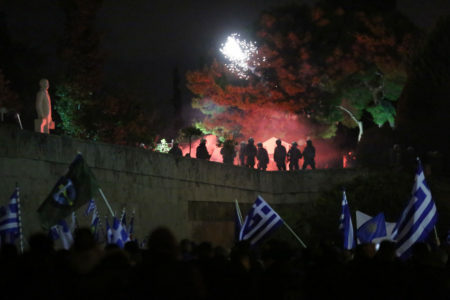 Greek authorities urged residents of a coastal region near Athens to abandon their homes as a wildfire burned ferociously, closing one of Greece’s busiest motorways, halting train links and sending plumes of smoke over the capital. In the late afternoon, a large fire had also broken out north and east of Athens. A local mayor said he saw at least 100 homes and 200 cars engulfed in flames. Wildfires are not uncommon in Greece, but a relatively dry winter created tinderbox conditions. Dozens of people died when forest fires ravaged southern Greece in 2007. “We will do whatever is humanly possible to control it,” said Greek Prime Minister Alexis Tsipras during an official visit in Bosnia. But he hinted that so many fires at once needed further scrutiny. “I’m concerned at the simultaneous outbreaks both east and west of Attica,” he said. Tsipras later cut short his visit to Bosnia and was scheduled to return to Greece. The army was drafted in on Monday afternoon to help fight the blazes. Some flights, mainly landings, were disrupted on Monday afternoon by low visibility and diverted elsewhere, air traffic controllers said. Authorities deployed more than 200 firefighters and 60 engines from across Greece to deal with the massive blaze at Kineta, a small resort town about 54 km (35 miles) west of Athens on a route tens of thousands of drivers use daily to reach the Peloponnese. A senior fire chief went on state TV to appeal to people to leave the area after some tried to stay in their properties. “People should leave, close up their homes and just leave. Dozens of homes were thought to have been damaged or destroyed by the blaze. Some householders took up hosepipes to douse the fires while police assisted with the evacuation of some areas. The main Athens-Corinth motorway, one of two road routes to the Peloponnese peninsula, was shut and train services were cancelled. Raging across land around the Saronicos Gulf, the blaze ravaged tracts of pine forest and was visible for miles. An ominous cloud of black-orange smoke hung over the Acropolis hill and the Parthenon temple in Athens on Monday afternoon. Live footage showed thick plumes of smoke hanging low over Rafina, an area east of Athens which has a population of at least 20,000. The town itself has dense vegetation.